Sanctuary Churches Brace For Clash With Trump Administration Churches across the country are preparing to offer shelter and protection to immigrants in the country illegally. That sets up a conflict between Trump's policies on immigration and religious freedom. 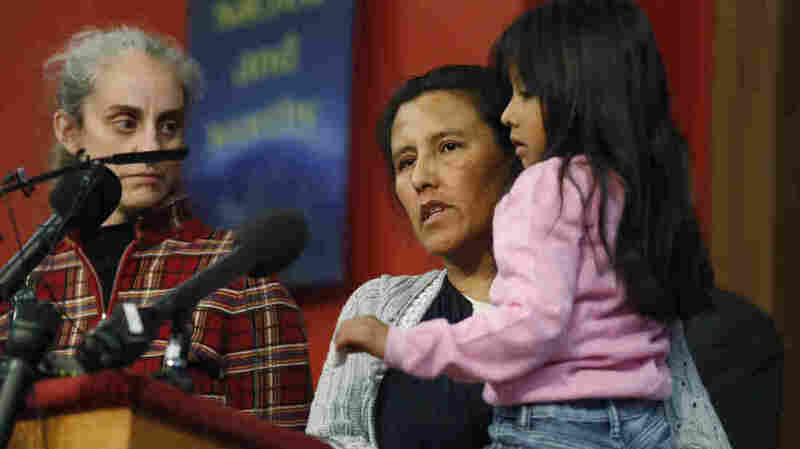 Jeanette Vizguerra, a Mexican woman seeking to avoid deportation from the United States, speaks Wednesday as she holds her 6-year-old daughter, Zuri, during a news conference in a Denver church in which Vizguerra and her children have taken refuge. Jeanette Vizguerra walked into a Colorado church on Wednesday — and into the forefront of a possible clash between Donald Trump and sanctuary churches across the country. Vizguerra has lived in the U.S. since 1997. She has four children, three of them born here. Vizguerra was due to check in with Immigration and Customs Enforcement. Instead, she took sanctuary inside the First Unitarian Society of Denver. "I did not make this decision lightly," Vizguerra said through an interpreter during a news conference at the church. "I was thinking about it for weeks. But I think that I made the right decision in coming here, instead of going to the immigration office today." Vizguerra may be the first immigrant to seek sanctuary in a church since the Trump administration took office, but she likely won't be the last. Across the country, dozens of churches and other faith communities say they're preparing to offer sanctuary to immigrants who are in the country illegally. Vizguerra pleaded guilty to using a fake ID in order to work in 2009. ICE officials say they've already granted her six stays of removal, and declined to issue another. 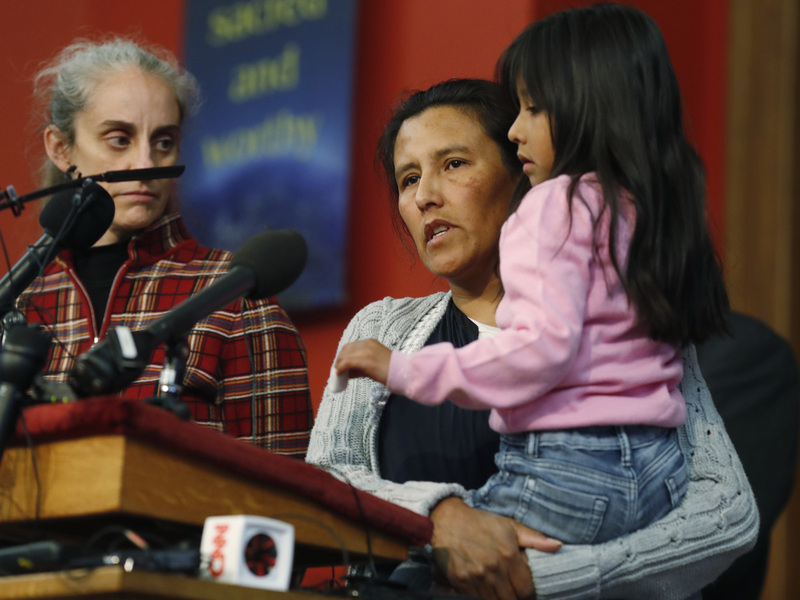 That's when Vizguerra sought refuge in the church rather than face deportation to Mexico. "It is our position as a people of faith that this is sacred, and faithful work," said the Rev. Mike Morran during the news conference at his church. "We know Jeanette. We know her to be an honorable human being." But critics say the church is violating law. "It is illegal for anyone to deliberately and knowingly shield an illegal alien from detection by federal authorities," says Jessica Vaughan, policy director at the Center for Immigration Studies, a nonprofit organization that favors less immigration. "Potentially these church leaders could be placing their parish at risk for prosecution and fines," Vaughan says. "I hope it won't come to that." For years, it's been federal policy not to do immigration enforcement in churches and other "sensitive locations," such as schools, unless absolutely necessary. That was spelled out in a memo issued by ICE in 2011, under President Obama. The policy is still in place, for now. "I think the administration thought it was prudent, politically and just aesthetically, to avoid rounding people up in places like hospitals or churches," says Richard Garnett, director of the program on Church, State and Society at the University of Notre Dame Law School. But Garnett says if new administration changes that policy, it could set up a conflict between two of President Trump's stated priorities: on the one hand, his push for tougher enforcement of the nation's immigration laws, and on the other, his administration's support for religious freedom. "God most definitely doesn't want to break up families," says Seth Kaper-Dale, pastor of the Reformed Church of Highland Park in New Jersey. In 2012, the church offered sanctuary to nine Indonesian immigrants who were set for deportation. Almost a year later, they reached an agreement with ICE allowing them to stay for now. "Sanctuary works," says Kaper-Dale. "I can tell you from our own experience that all nine people who lived here have kept their families together, have been able to raise their children, have been able to go back to their jobs. Is sanctuary brutally hard? Yes. But it is a tool that we will use, if we're forced by a brutal regime to use it." But Jessica Vaughan at the Center for Immigration Studies argues that this is not a question of religious freedom. "I see it more as a campaign to try to push back against the restoration of serious immigration enforcement," Vaughan says. "I think it remains to be seen how popular it's going to be, if it's going to be at all effective. I don't think it will be." Sanctuary church advocates insist history is on their side. John Fife is the former minister of the Southside Presbyterian Church in Tucson, Ariz., which helped spark the sanctuary church movement of the 1980s and '90s to help migrants from Central America get asylum. "That movement changed the public perception of the issue, and resulted in the government changing its policy," Fife says. It also resulted in the arrest and conviction of Fife and other activists. Sanctuary churches today say they're prepared to continue that work, too.